I am thrilled and honored to welcome award winning author, Richard Michelson, to my blog. 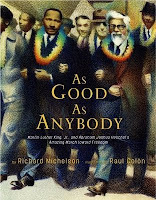 His book, As Good As Anybody: Martin Luther King and Abraham Joshua Heschel's Amazing March Toward Freedom (illustrated by Raul Colón) was awarded the Sydney Taylor Award Gold Medal. This eloquent book explores an important time in American history and the goodness of the people who came together for freedom. The beautifully written text of such a poignant, historic story is ageless and timeless. As Good As Anybody has the potential to educate, inspire, and bring communities together for the common good. It is an outstanding example of the power of books. What was your inspiration for writing As Good as Anybody? Inspiration, when it visits me, always seems to follow a very slow, pedestrian course.Well before I was writing children’s books I was exploring my childhood confusion concerning violence and racial issues, both in my poetry (Battles and Lullabies, U. of Illinois Press) and essays (a recent essay called Jews and Blacks can be read on the homepage of my site (www.RichardMichelson.com). When I was born, my area of East New York, Brooklyn, was 90-percent Jewish. Twelve years later, less than 10 percent of those living in the neighborhood were Jews. There was anger, bitterness--and friendship --on all sides. Much of my work is an attempt to both heal society’s racial wounds, and those within myself. When I began to write children’s books I decided to fictionalize my old neighborhood at the 50/50 point. Across the Alley, (a 2006 National Jewish Book Award finalist and PJ Library selection) is about two boys, one Jewish and one black, who are not allowed to play together, but whose bedroom windows face each other's. At night, when nobody is watching, they become secret best friends. It was while writing this story, that I remembered the friendship of King and Heschel, and I decided to examine another facet of a situation where social convention tries to keep people apart, but individuals attempt to overcome their differences. Are there some interesting facts about the relationship between Reverend King and Rabbi Heschel that you did not include in the book? Reverend King was killed on April 4th, 1968, just 9 days before Passover was to begin. King’s emphasis on the Jewish Exodus in his sermons formed the basis of a strong bond between both men and King and his family had planned to join the Heschel’s at their Seder. What a wonderful holiday celebration that might have been. I am sure it would have forged further alliances between the two men. Research is my favorite part of any project, though sometimes I suspect it becomes an avoidance mechanism. I had to tear myself away from reading books by and about King and Heschel, and force myself to begin writing. Coming into the project I knew more about King, so I primarily reread some of his speeches, to put his cadences back into my head. Like many secular raised Jews of my generation, what little I knew of Heschel, was centered on his anti-Vietnam stance, and that famous photo of him marching with King, which Raul Colon brilliantly interpreted for the book cover. I ended up reading Edward Kaplan’s biography of Heschel (and I was very pleased, months after publication, to run into Mr. Kaplan at a lecture by Susannah Heschel, Rabbi Heschel’s daughter and an accomplished scholar in her own right. The three of us had much to talk about and have kept in touch). I also read Or Rose’s YA bio, and Heschel’s essays Moral Grandeur and Spiritual Audacity, which I heartily recommend. It is an inspiring, sometimes difficult, always thought provoking book. And purely for my own enjoyment, I read Heschel’s poetry. Of course, I badly wanted to show off all my new “smarts,” so the most difficult part of the project was cutting out all that was extraneous to the core story. Hmmm. I am really not much of a holiday person, to my wife and children’s constant chagrin. One of my yearly pledges to myself is to slow down a bit and learn to enjoy a more leisurely holiday pace (spoken, I realize, as one who does not have to do the holiday cooking). Still, if I had to pick, I admit that, though I hate the long drive to and fro, I do look forward to Passover every year. I get to catch up with the cousins and I can’t resist my lovely wife’s potato-carrot kugel. Richard, thanks so much for sharing your writing journey with us! 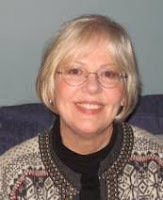 Pegi Ballenger was born and grew up in Houston, Texas. She graduated with a Bachelor of Fine Arts degree from Newcomb College of Tulane University in New Orleans, LA., later returning to school to study commercial art, television production, and computer graphics. Pegi has lived in several places, but has called Colorado home for almost 30 years. In addition to her art career, Pegi has worked as a copy writer, a continuity director for television, and an advertising director. She freelances as an illustrator and graphic artist, and teaches adult and children’s art classes. Two books with her illustrations have been published; KAT’S MAGIC BUBBLE and A MOUSE IN THE RABBI’S STUDY. She is a member of SCBWI and a founding member of the Pikes Peak Pastel Society. Pegi, her husband Ray, and their dog live in Woodland Park, CO.
A Mouse in the Rabbi's Study is a book about a mouse trying to find a place to live for the winter. 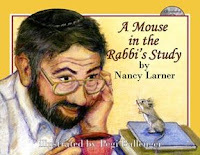 A rabbi, who is a messy eater, decides that the mouse can stay in his study if he will clean up all the rabbi's crumbs. As the weeks and months go by, the rabbi teaches the mouse about the Jewish holidays and special foods associated with each one. There is a fun surprise ending. As an illustrator, is it challenging to create art based on a writer's words? Yes, it can be challenging. Fortunately, most writers are good with words and can explain things well. The key, in addition to reading and re-reading the text, is to listen and ask questions. Nancy and I hit it off immediately and I understood her approach to the book right away. She wanted it to look like the time she was growing up because so much of her childhood memories are of the wonderful traditional foods her mom made. However, no matter how well I think I understand things, some rework is inevitable. When that happens I remind myself that it's part of the job and I'm grateful for it! Yes, I had to research clothes, things from the 1950's, historical costumes, and some of the foods to make sure I was painting them correctly. At the sketching stage, the author and I would talk about any changes she thought were needed. There were very few changes after the sketches were approved. I paint and show my work when I'm not illustrating, and do a little teaching as well. I'm looking for another book illustration project and hope to find one for 2009! I spent 10 years as a lay leader of my synagogue's children's services while my own children were growing through the various levels of children's services. During that time I sought stories that addressed the situations I knew the children were encountering and, in the process, would make Jewish values and Torah meaningful. I also wanted stories that shared the attitude of the children. The children didn't like being at services or at synagogue; they didn't like aspects of Jewish holidays or Jewish practices. The characters in various stories don't like those things either, but in the course of the story the characters come to a different appreciation and change of attitude. I spent a lot of time reading Torah and books on Jewish practices to make sure the stories were accurate from the standpoint of the Conservative movement. During that time I also participated in various Jewish adult learning programs and applied some of what I picked up to the stories. Maybe my best research was the actual reading of the stories aloud each week, first to my own children and then to the larger group attending children’s services. They make it abundantly clear what works and what doesn't. Yes, I'm working on a series of Jewish children's picture books that revolve around Jewish practices in the home. The stories are told by two savvy cats who observe the family they live with and are knowledgeable about Jewish practices and Yiddishkeit and even try to participate in the practices, often with silly consequences. Like children, they sometimes get into trouble or disrupt things but they really enjoy living as Jewish cats. They love chasing dreidels and hunting down the afikomen with the children. Protecting the Sukkah from squirrels turns into an epic adventure. I hope the stories will come out in 2009 as the Meow stories: Shabbat Meow, Chanukah Meow, Pesach Meow, Sukkot Meow, and more. Shalom Beiyit Meow tells about the family adopting a new puppy, Miezuzah Meow describes the family’s move to a new home. Alan, thank you for sharing your thoughts about your creative journey!